The early part of the year is the time to catch up with album design and ordering for my brides. Today I was reliving a delightful wedding, when Danielle and Drew married. And to explain the title, she’s the teacher and he’s the fireman. And married in his uniform - who doesn’t love a man in uniform? Let me share some of the spreads from their album and mention a few things. Danielle and Drew had their ceremony at the old Knox County courthouse in downtown Knoxville. That’s a great setting in a grand, old Victorian courthouse. I have shot a ceremony there before and expected to be taken into a room used for weddings. And . . . no, that did not happen. Instead, a clerk said, “Follow me” and led us to a back hall, with a small exit alcove off to the side, leading to glass doors. As it turned out, the head of the courthouse was moving her office and renovations were being done. That meant that weddings would take place in the aforementioned alcove, with the clerk’s back to the glass doors and the couple in front of her. Oy! A bright background and a foreground in shadow is not ideal for pictures. You have a choice: exposure for the couple and allow the background to blow out or expose for the background and turn the couple into silhouettes, or at least dark figures. Or . . . tell the clerk, “Hey, don’t start until I put up some lights, please” and get the couple exposed while preserving the highlights in the back. I know the clerk wanted to “git-r-done” but sometimes a wedding photographer has to be insistent (in a nice way) to make sure things are done properly. That was my option. That’s how I roll. It is your wedding. 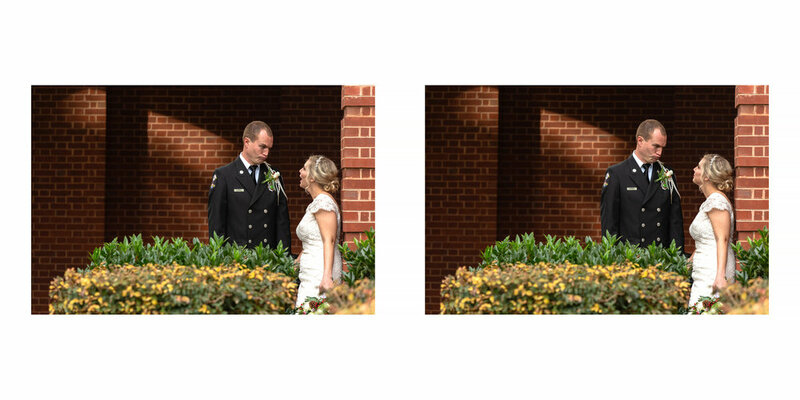 I enjoy photographing smaller weddings like this - less hustle alla round! I am a US Army veteran. My brother and cousins are first responders. So for active and retired military, as well as first responders, I offer a 10% discount on anything. Wedding collection, print, etc. This past weekend I was at the Pink Bride show in Chattanooga and it occurred to me as I was talking to a future bride why I give so much attention to my albums. If you go to a fine steak house, do they just slap the meat on the plate? Or is it plated so that the food makes for a fine presentation because, after all, it is a gourmet meal? If I may say so, I think my photography is a feast for the eyes and just as with a gourmet meal, my work is not finished until I can present you with a beautiful heirloom that displays the photography that I have put a great deal of work into to make it something epic. Viewing pictures online is good but nothing compares to holding printed material and having the ability to sit and really study an image. The design of an album should be readable and flow to tell the story of the day. I have seen albums where images are just crammed in, trying to fit as many as possible. No - vary multi-image spreads with single-image panos, use negative space, be aware when a group of pictures tell a story within a story. I was so happy to be there for Danielle and Drew, and I suspect I will be seeing their story continue through my lens as they start a family. What lovely people!